Wanting to play off the natural agility and speed common among predatory dinosaurs this force is designed to dominate through above average overall speed...and who doesn't love freakin' armored dino's with guns?!. The Allosaur and Raptor units have identical speed profiles allowing them to use coordinated attack patterns. This allows them concentrate their efforts and take down larger opponents or harass and corral until the T-Rex can join bringing its impressive firepower and assault abilities to bear. The Hunter Lt. Infantry are used to dig in and hold objectives. The Ru-lon Empire suffered a crash landing on a primitive earth thanks to a miscalculation during a hyperspace jump. To their amazement they discovered a world rich in natural resources and ripe for the taking...but populated with many incredibly dangerous and vicious predators. Unfortunately most of their engines of war had to be cannibalized to make even basic life support systems operable again. Realizing the native fauna were perfectly adapted to the environment and didn't require massive power plants like their engines did they decided to enslave the beasts. Using a version of their 'slave serum' they were soon able to capture and weaponize the most powerful of the animals, despite initial gruesome and heavy loses to their compliment of soldiers. 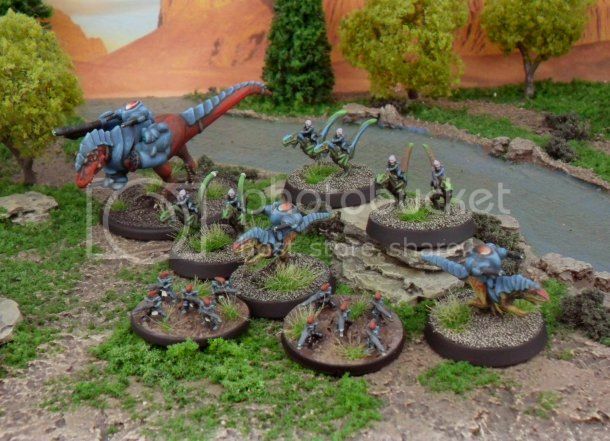 Miniatures from Microworld Games and Onslaught Miniatures. Thanks guys! Im loving 6mm!